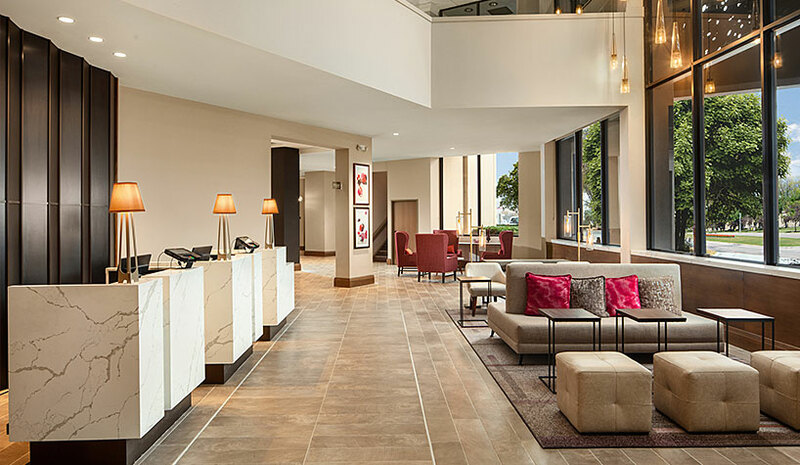 Pacifica Host Hotels recently wrapped up a multimillion-dollar redesign of the Crowne Plaza—Dallas Market Center hotel. All 354 guestrooms at the 21-story property now have new furniture, mattresses, textiles, refrigerators and bathrooms, with 120 units including the WorkLife Room design—a patented and trademarked room design concept by Crowne Plaza. The redesigned Bristol Bar & Grill debuted an open kitchen concept, stylish seating and a fresh, sleek ambiance. Exterior and interior lighting, including building signage, has been replaced with energy-efficient LED light fixtures. Holiday Inn & Suites Chicago North Shore recently completed a comprehensive, multi-year $10-million renovation project. The property-wide transformation includes an overhaul of the hotel’s 15,000 sq. ft. of flexible banquet and meeting space, in addition to a complete revamp of the 250 guestrooms, lobby, indoor pool and public spaces. Additional upgrades to the 250 modern guestrooms with Holiday Inn’s new H4 design concept, include 40 new studio suites. Providing all of the comforts of home, new room amenities include roller blackout shades, mobile table and task chair and a welcome nook. The Litt Group has completed the renovation of the Candlewood Suites Athens in Athens, GA for Waramaug Hospitality. The four-story 97-suite hotel was built in 2009 and acquired by Waramaug last year. The Litt Group worked with the brand and ownership to ensure the PIP brought the property up to current Candlewood brand standards. The comprehensive renovation included a new exterior paint scheme, monument signage, channel letters and the gazebo was modified to include an ADA ramp. All suites received brand new case goods, window treatments, artwork, mirrors and bathroom vanities. The kitchens were upgraded with new cabinets plus stone backsplashes and new flooring to follow the LVT scheme.